This article first appeared on the Dark Jane Austen Book Club Website on March 11, 2013. 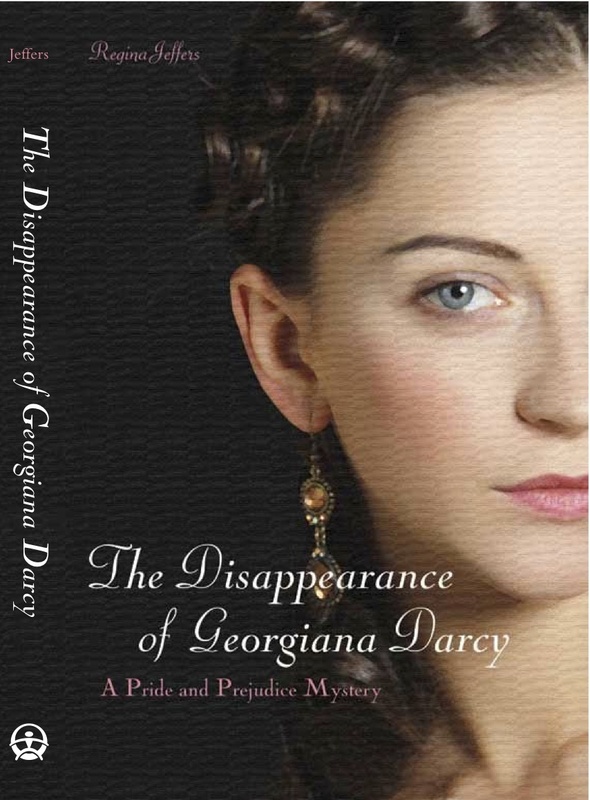 When it was first released, one of the means I used to introduce my readers to The Disappearance of Georgiana Darcy was to take a closer look at the area which hosts the Old Grey Man, the Awful Hand, and the Murder Hole. 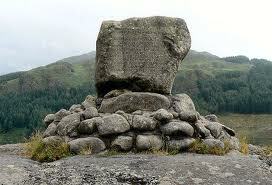 The book is set in the Scottish Uplands, in a land drenched in legend and mystery. It is an area where the heather in bloom can steal one’s breath with its beauty, but where nature can also teach harsh lessons. The Range of the Awful Hand looking west across Loch Enoch. The closest hill is Merrick, Benyellary is not visible. As part of the Range known as the Awful Hand, the Merrick is a 2766-foot hill. 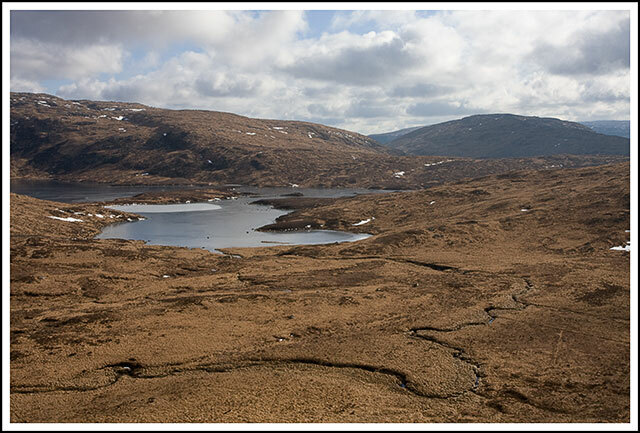 The Merrick descends to Loch Enoch, the Grey Man, the Murder Hole, and a host of other lochs. Nine miles of wilderness walk traverses the area. The Range of the Awful Hand is a string of hills in the Southern Uplands of Scotland so named because of their resemblance to the fingers of a hand. The hills, starting at the ‘thumb’ are Benyellary (719 m); Merrick (843 m); Kirriereoch Hill (786 m); Tarfessock (697 m); Shalloch on Minnoch (768 m). The wilderness walk starts at Bruce’s Stone, a monument erected in memory of Robert Bruce’s defeat of the English at Glen Troll. If one knows anything of the battle, he realizes the monument represents Bruce’s men rolling huge rocks down the hillside on the advancing army. 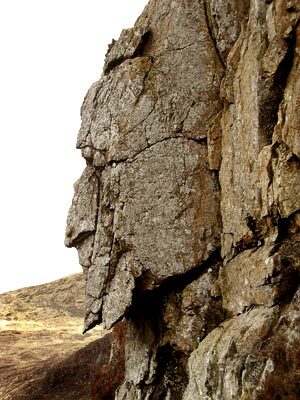 The “Grey Man of Merrick” is an eerie rocky outcrop aptly named, as it clearly resembles the stony face of an old man. He sits just below Merrick Hill, acting almost as a guard to the highest hill in Galloway. If one is adventurous enough to set out on foot in the area, it is best to approach Loch Neldricken via the Rig of Loch Enoch. The advantage of walking along the Rig of Loch Enoch is it is high enough to keep a person from the bog lands below. There are no paths, and the grass grows in lumpy tufts making walking quite difficult. Sometimes one’s feet will disappear into a deep shuch, and a person ends up covered in mud. In this photo, one finds the infamous Murder Hole. It is the round pool to the right of the loch in this photo. Legend has it that many years ago weary travelers were robbed and their bodies dumped in the hole never to be seen again. In summer there is a ring of reeds growing around the hole, but none grow in it. People say the bodies keep the deeps too warm for the reeds to grow. It is also rumored that in even the coldest winters, the center does not freeze. Though it is claimed the real Murder Hole is near Rowantree Bridge on the Water of Minnoch where the bodies of waylaid, murdered travelers were dumped, the “Murder Hole” refers to an incident in Samuel Crockett’s novel The Raiders. 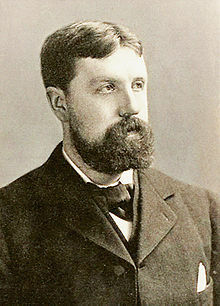 Galloway’s landscape and its legends inspired Samuel Rutherford Crockett (1859-1914), a writer with a prodigious output. The Raiders, his best-known book, was a romantic, loosely historical, adventure story, which sold thousands of copies in 1894, and further editions were published to meet demand. In her book The Life and Times of Samuel Rutherford Crockett, Islay Murray Donaldson stresses that, due to various circumstances, Crockett could not afford the luxury of spending enough time on his literary efforts, so he never reached Stevenson’s sustained heights or enduring popularity. So, this is the setting for the mystery behind The Disappearance of Georgiana Darcy. Is it not perfect? One of the best sites for photos of this area is Walkhighlands. This entry was posted in British history, Georgian England, Georgian Era, gothic and paranormal, Great Britain, historical fiction, history, Jane Austen, legends and myths, Living in the Regency, Living in the UK, mystery, Pride and Prejudice, real life tales, Regency era, Scotland, spooky tales, Ulysses Press, writing and tagged cozy mystery, Jane Austen, Merrick's Murder Hole, mystery, Pride and Prejudice, Samuel Rutherford Crockett, Scotland, Scottish legends, the Awful Hand, The Disappearance of Georgiana Darcy, The Mysterious Death of Mr. Darcy, the Old Grey Man, Ulysses Press. Bookmark the permalink.